In our recently published paper https://elifesciences.org/articles/34880, we report that the transcription factor Pitx2c has an unexpected role during gastrulation, where it acts cell non-autonomously to promote mesendodermal cell migration required for axis extension in zebrafish. “It is not birth, marriage or death which is the most important time in your life, but gastrulation. Undoubtedly, gastrulation is a critical time during development, as the entire body plan is defined by what happens at this stage. Cells must undergo intricate and complex movements to generate the three germ layers and end up in the correct location to give rise to all of the parts of the body. Not only is it an absolutely beautiful event to observe, it is also an essential developmental process that is well-suited for probing important questions surrounding cell behaviour during migration and embryonic patterning. This process is especially clear in the zebrafish embryo – its optical transparency and amenability to live imaging allow one to attain single-cell resolution to examine cellular behaviours in real-time. When I joined Didier Stainier’s lab as a postdoc, I wanted to focus on questions surrounding cardiac laterality in zebrafish. While it has been known for over 20 years that the transcription factor Pitx2c is a critical player in defining the left side of the body, many questions surrounding how Pitx2c directs this process remain to be explored. Around this time, Didier was in contact with Patrick Blader from the Centre de Biologie du Développement, Université Paul Sabatier in Toulouse. Patrick’s lab had recently generatedzebrafish mutant alleles in pitx2, and he generously shared his line with us. We started analysing these mutants, and at first, I was rather disappointed that we did not see any defects in cardiac laterality! However, when we looked at the phenotypes in embryos lacking both maternal and zygotic (MZ) Pitx2 function, we observed many embryos at 24 hours post-fertilization with shorter bodies and somite defects. These phenotypes were reminiscent of many of the gastrulation mutants recovered in ENU screens, and so we began exploring the role for maternal and zygotic Pitx2c function in more detail. We first questioned whether any patterning defects were present in MZpitx2c mutants during gastrulation and early somitogenesis and looked at the expression of many genes by in situ hybridization. While the different germ layers were present, it was obvious that the cells were not in their correct location. For example, we observed that the cells giving rise to the notochord were located in a wider domain than in wild-type embryos. We also found that at late gastrulation, mesendodermal cells looked rather disorganized, arguing that cell migration was likely affected in these mutants. Gastrulation movements in zebrafish have been very well described. While epiboly spreads the cells of the epiblast down around the yolk, mesendodermal precursors separate from the epiblast and migrate away from the margin via internalization movements. Internalization is followed by convergence and extension movements that mediolaterally narrow the embryo, while elongating them along the anterior-posterior axis. We first focused on assessing convergence and extension movements in the mutants since they presented phenotypes suggestive of defects in these cell behaviours. 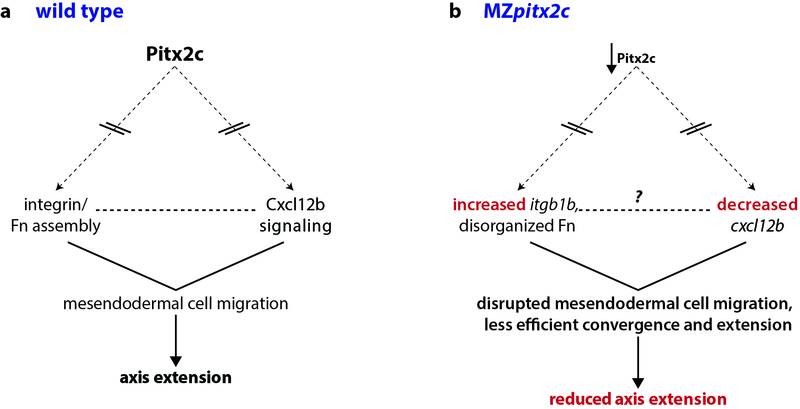 To test whether convergence and extension movements were affected in the MZpitx2c mutants, we photoconverted lateral mesendodermal cells and tracked their migration over time. These experiments suggested that both dorsal convergence and anterior extension were reduced. Similarly, we observed that the distance between the prechordal plate and the notochord at the 1 somite stage was reduced in MZpitx2c mutants compared to wild types, and when we looked at cell morphology within the notochord of mutants, we found that the cell shapes were rounder and failed to elongate mediolaterally as in wild-type embryos. These data suggested to us that Pitx2c functions to promote convergence and extension movements. Previous work from our group and others has described the movements of endodermal cells. In this population of cells, early gastrulation movements undergo a ‘random walk’ motion to spread endodermal cells across the embryo; at late gastrulation, endodermal cells rapidly increase their speed and migration trajectories, becoming straighter and oriented towards the midline to form the endodermal sheet. When we examined these behaviours in MZpitx2c mutants, we observed that the transition between random walk motion to oriented, persistent migration was blunted. Taken together, our data indicate that cell migration behaviours during late gastrulation are strongly disrupted in the absence of maternal and zygotic Pitx2c function. We then performed transplantation assays, which really gave us critical insight into the role of Pitx2c. In these experiments, we transplanted mesendodermal cells that expressed LIFEACT-GFP into unlabelled host embryos, allowing us to analyse cell migration behaviours at single-cell resolution. What was especially striking were the observations that wild-type cells that were transplanted into MZpitx2c hosts sent out fewer projections and their morphology was flattened. These key observations indicated that Pitx2 is required cell non-autonomously to promote migration behaviours of mesendodermal cells. Movie: WT cells expressing LIFEACT-GFP were transplanted into WT (left panel) or MZpitx2c mutant (right panel) hosts. Transplanted WT cells exhibit increased surface area and extend fewer protrusions that appear more actin-dense in mutant hosts compared to WT hosts. At the same time, we were also analyzing microarray data from MZpitx2c mutants and in embryos where we had injected pitx2c mRNA at the 1-cell stage. One of the top hits in these analyses was a gene encoding the chemokine ligand Cxcl12b. A few years ago, the Schilling and Kikuchi labs showed that mesodermal expression of cxcl12b (or sdf1b) was important to coordinate and guide the movements of the endoderm, which express the receptor gene cxcr4a. They also proposed that Cxcl12b/Cxcr4a signaling promotes integrin-mediated adhesion for coordinated mesendodermal cell migration. Furthermore, Cxcl12b/Cxcr4a signaling regulates the formation of filopodial processes in gastrulating mesendodermal cells. Together, these data fit very nicely with the phenotypes we had observed in MZpitx2c mutants, and so we focused our analyses of these pathways. Indeed, we found disrupted expression of cxcl12b and the integrin subunit gene itgb1b, as well as altered deposition of Fibronectin between mesendodermal cells. Therefore, these data suggested that Pitx2 functions upstream of chemokine-dependent changes in adhesion to the ECM to influence cell migration. Pitx2 is a transcription factor that plays diverse roles in many tissues and developmental contexts. In humans, mutations in PITX2 coding regions lead to Axenfeld-Rieger syndrome, while promoter/enhancer mutations are associated with atrial fibrillation. Despite these clinically relevant syndromes, few downstream pathways have been identified. In our paper, we describe a role for Pitx2c where it promotes convergence and extension movements during gastrulation. Using transcriptomic analyses of pitx2c gain- and loss-of-function embryos, we identify transcriptional changes in genes involved in chemokine-ECM interaction and signaling. We hypothesize that the early function of Pitx2 during gastrulation is evolutionarily conserved. Recent work from the Stern and Viebahn groups has shown that Pitx2 expression precedes the formation of the primitive streak in chick and rabbit embryos. We were also very excited to find expression of pitx2 in single-cell RNAseq datasets of early gastrula stage mice and frogs, suggesting that Pitx2 is also playing an early role in these species. These studies raise the question as to whether similar mechanisms downstream of Pitx2c are at play in other developmental contexts. As the Nodal-Lefty-Pitx2 cascade appears to be conserved at both the onset of gastrulation and during the establishment of left-right identity, it will be exciting to explore whether the downstream pathways we identify here are conserved in other contexts.